ENGIMAcoustics' contribution to the electrostatic speaker art is a new hi-tech coating for a non-conductive membrane foil. This advance garnered them a 2013 CES Design and Engineering Showcase Honors award. Their solution permanently impregnates a self-maintained nano-particle electron charge on the diaphragm to—puff—eliminate the traditional requirement for an externally applied bias of several kilovolts. The company has also rethought their stator plates which become a copper-covered fiberglass substrate. 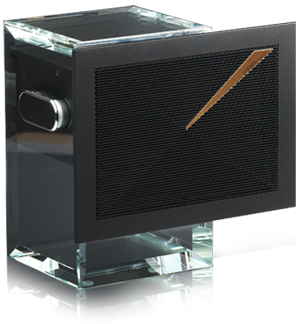 The first product showcasing their innovative self-biased ESL technology was the 10.4lbs Sopranino add-on super tweeter with glass stand and anodized aluminum enclosure of 7.2" x 7.7" x 8.3". Like all such devices it taps into the main speaker's terminals*. A switch on the rear panel moves the built-in 2nd-order high-pass from 8-10-12kHz with concomitantly narrowed dispersion. Operational bandwidth is 8 to 40kHz ±3dB. Like traditional ESL, the "ultra-thin almost weightless microns-thick diaphragm is sandwiched between two metal stators (music signal carriers) and push/pull between their electrical fields. The SBESL™ film maintains a constant electric field rather than constant voltage (ESL) and is non-conductive so the classical IMD phenomenon which our predecessors suffered is eliminated." * With a 3Ω min impedance at 12kHz, the Sopranino is far from an invisible load on your amp. Relative to matching its output to your main speakers, its 1m/2.83V sensitivity is 90dB which a switch can step down to 87dB. High-efficiency speakers thus will go loud far quicker than the super tweeter to likely render its contributions marginal or inaudible. Designed to sit atop the main speaker, you'll want flat tops. Even so very tall boxes with central tweeters surrounded by a d'Appolito type array of mids and woofers will have the Sopranino fire well above your head far removed from the main tweeter to again be less effective. With such boxes or those of seriously sloping, rounded or otherwise unsuitable tops, you'll want proper stands to set up the Sopranino next to the speakers which could be cosmetically compromised. 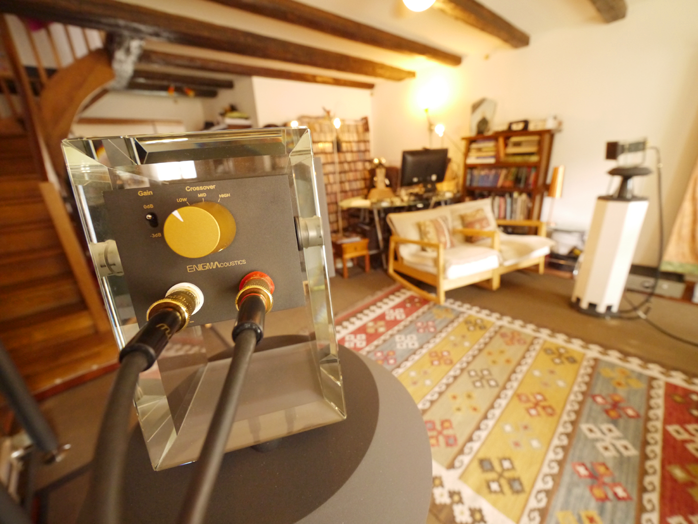 From Tannoy to Townshend, from RadioShack to muRata, super tweeters operating beyond the traditionally accepted 20kHz limit of human audibility have collected anecdotal evidence for benefits within the audible range including bass. The how and why for such benefits are less decisive. "Better phase and transient response" don't seem terribly plausible when super tweeters don't replace but double up and thus partially overlap existing tweeters. It leaves whatever time-domain sins the main tweeters commit in place. Shouldn't that interact and increase rather than diminish confusion? Can tacked-on bandwidth alone mitigate phase errors? At $3.900 including a peach-wood presentation box, the Sopranino pair costs twice what Anthony Gallo's superlative Strada 2 two-way monitors command. The latter's proprietary 180°-dispersion high-output CDT3 with 40kHz extension acts as its own super tweeter. Just how costly would a main speaker have to get before a Sopranino becomes unflinching par for the course? And wouldn't you then expect a very costly speaker to include its own super tweeter like Vienna Acoustics' The Music at right does with its muRata? Or a Raal-type full-tweeter ribbon with response to >50kHz? For the Sopranino some could feel that the enigmatic branding is perfectly apropros. From a marketing perspective, Sopranino is the firm's proof of concept for their self-charged coating. It also introduces their invention in the smallest possible form factor. And it mates with what you've already got, particularly in tandem with the ubiquitous soft-dome tweeter of limited reach. Nobody needs to first convert to full-size ESL panels before getting a taste of this. That ENIGMAcoustics went uptown with the glass enclosure and luxo delivery packaging indicates deliberate positioning as an upmarket brand. The promise of new higher/better tech rests on the implicit need to be expensive. Let's face it, the entire Martin Logan ElectroMotion ESL with dynamic woofers below 500Hz we recently reviewed costs less than these partial tweeters. Should the newcomer from Irvine/California introduce a full-range self-biased electrostatic speaker in the future, we've been set up to expect a solid five figures already. Or might there be licensed spin-offs and OEM ventures? For now the firm's first two complete speakers merely exploit their tech for tweeter bandwidth to run conventional dynamic drivers below.